MIAMI -- Links golf isn't the first thing that comes to mind when talking about Florida, but in Miami, when the wind is kicking up -- which is quite often -- there can be a links feel to it. No. 17 on Doral's Jim McLean Signature Course has water off the tee and in front of the green. When you add tight fairways, small greens and plenty of water, it can get a little scary, especially during the stretch run when every stroke counts. Miami is known for being a balmy, hot city with an impressive nightlife, but the golf is tough, and there is plenty of wind blowing through the palm trees that line most fairways. South Florida golf features water on almost every hole, so easy shots are tough to come by. Coming down the last three holes is always a challenge, especially when there are a few bucks on the line, and most of Miami's well known courses tend to show their teeth at the worst times. The West Course at the Country Club of Miami, a Robert Trent Jones layout, plays to 6,970 from the tips, but don't think about the yardage. The fairways are tight, and there is water everywhere. No. 16 is a 523-yard par 5, but while it is reachable in two for the bombers, it isn't a good idea to go for it if your driver isn't on target all day. The tee shot requires a long hit over two bunkers into a small sliver of a fairway. The hole plays uphill and is only 18 yards wide in the landing area off the tee. With water on the right all the way down the fairway, and out of bounds on the left, playing it safe is the way to go. "You either hit it straight or get wet," Head Professional John Miller said. "You have to deal with a narrow fairway and the wind. It doesn't get any easier after that." The 17th is a long, 453-yard par 4 that plays directly into the wind. There's an open landing area from the tee, but a creek fronts the green with a bunker on the right side, with Australian pine trees all the way down to a false-front green. "Bogey is not bad," Miller said. The closing hole is a 392-yard par 4 with seven bunkers, including four that surround the green. The bunkers are deep. A recent leader in a mini-tour event led by three shots heading to 18 and ended up in a playoff after a triple bogey. 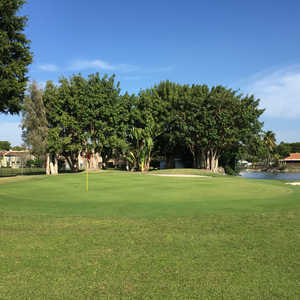 The trees are no breeze at the Senator Course at Shula's Hotel & Golf Club -- part of former Miami Dolphins coach Don Shula's complex in Miami Lakes. As a coach, Shula was tough on his players, and he is tough on his golfers, as well. No. 16 is a 500-yard par 5 from the tips, and after crossing a creek that goes through the fairway, there are trees on both sides leading to the green. It is reachable but only for straight hitters. A bunker fronts the green on the left side, and the green has a deep slope from back to front. The 17th is a short, 162-yard par 3, but the green is tiny with a bunker up front and trees everywhere. Hitting it above the hole is not an option. "Put it up top," said Kenny Fill, director of golf. "Miss it up top, and you have no chance. The slope makes it impossible." No. 18 is a 412-yard par 4 with a 90-degree dogleg left, guarded by a lake. Scoring all depends on how much of the dogleg you want to cut. If you choose to avoid the lake, there are trees all the way down the right. 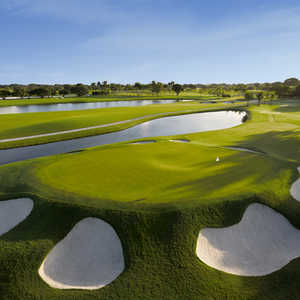 Doral is known for its TPC Blue Monster course, home to the World Golf Championships-Cadillac Championship on the PGA Tour, the consensus lately is that the Jim McLean Signature Course might be the toughest of all five courses at Doral. Professional Mark Reischer said its closing holes are some of the toughest in golf. "I know the courses here," Reischer said, "and I think the Jim McLean Course is by far the hardest: tight fairways, water on every hole on the course and tough greens." Just getting to No. 16 is tough enough, but it gets tougher down the stretch. 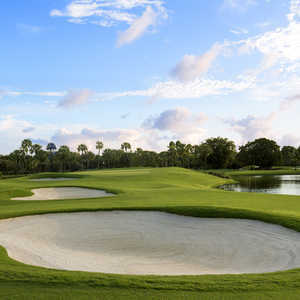 It is only 409 yards, but there's nothing but water on the right and a tight landing area with two bunkers on the left. Driver might not be the best idea unless you can crush it. No. 17 is a 433-yard par 4 with water off the tee and in front of the green. The landing area is generous, but the approach shot can be brutal. The closing hole plays 424 yards and has water everywhere, with four bunkers around the small green.